While film adaptations of television shows aren’t new, Get Smart (2008) was certainly in the era when the idea to do so had become popular (even if we’re still trying to forget Bewitched (2005)). What’s nice about Get Smart is that it falls into that “self-aware” category, mainly because the source material (i.e. the 1960’s TV show of the same name) was already self-aware when it came to the “spy” genre made popular by James Bond. Of course, it’s no wonder that the king of parody, Mel Brooks was involved in both the TV show and this film adaptation. Of course, while the humor was more bathroom-oriented than witty, many of Carell’s lines played off of the amusing nature of taking everything literally. Also, the bumbling nature of his new field agent character, Maxwell Smart, was certainly entertaining (as it is clearly Carell’s forté), even if it was abandoned at times to advance the plot through action. In fact, it did its best to not try and fall into the same old “action movie” genre, even if the end sequence certainly fits that bill. Sometimes the fight scenes seem out of place considering the frequency of Smart’s goof-ups, but they do help keep the character at least somewhat realistic. Younger audiences will likely not understand some of the nods to the source material. I’ve only seen part of one episode of the original TV show, but even from that limited knowledge, I’d have to say that this film was a close proximity to the original. While it follows almost every one of the tropes of the spy genre (including the attractive woman, of which Anne Hathaway definitely fits the bill), Get Smart doesn’t stand out much more than any other spy parody like The Naked Gun (1988) or Johnny English (2003). At least, as far as TV adaptations go, it wasn’t Bewitched. 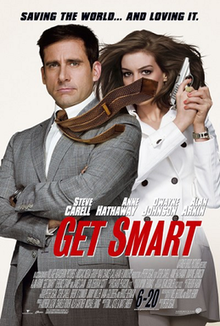 No really big laughs, but continuous chuckling throughout, I give Get Smart 3.5 stars out of 5.